I have an appetizer recipe for you today that is delicious! 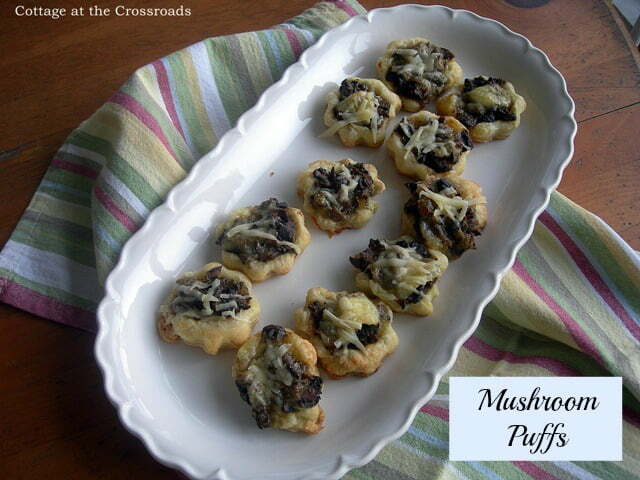 I’m calling it Mushroom Puffs because it’s made with puff pastry, Brie cheese, portabella mushrooms, and a few other good things. With a mix of those ingredients, you can’t go wrong! I was served something similar this past weekend when we were visiting with our friends Rick and Trish. They had invited another couple to dinner, and they brought this appetizer with them. Everyone thought it was wonderful, and it quickly disappeared. I asked about the recipe and Mercedes described how she had made them. So I recreated them today so I could pass along the recipe to you. First, you will need some frozen puff pastry. Take it out to thaw about 20 minutes before you are ready to use it. You will use both sheets for this recipe. 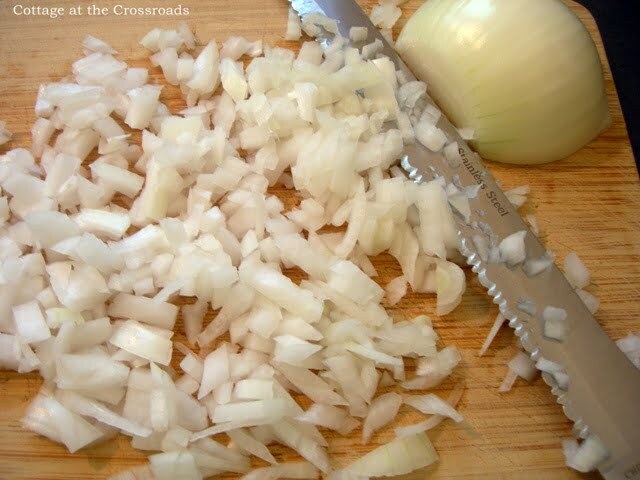 Chop one onion and 3 cloves of garlic. Melt 2 tablespoons of butter in a pan and saute the onions and garlic on medium heat for about 10 minutes. 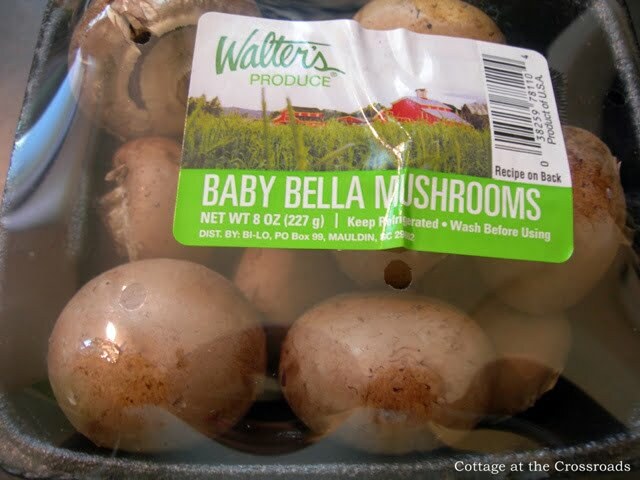 Meanwhile, clean and wipe dry 2 packages of baby portabella mushrooms. 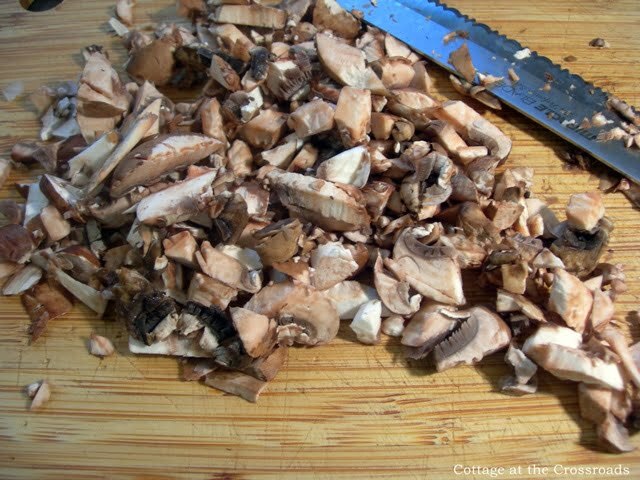 Chop the mushrooms and add them to the pan with the onions and garlic. Continue to cook for about 20 minutes on medium heat. Stir frequently and mash the mixture with the back of a wooden spoon as it cooks. Let all the moisture evaporate. Add 1 teaspoon dried thyme, and salt and pepper to taste. 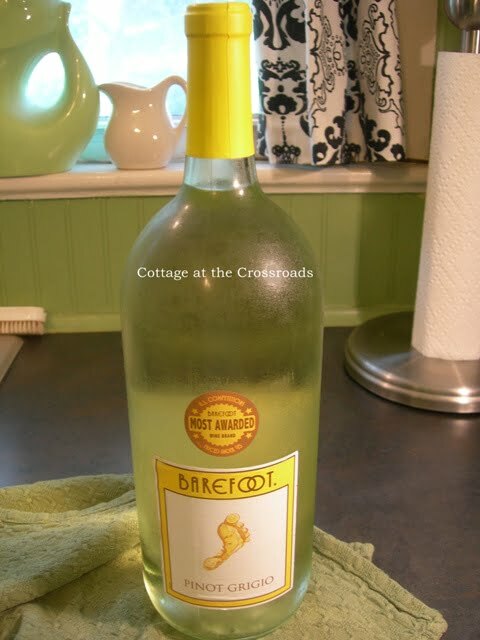 Add 2 tablespoons of white wine to the mixture. This is our favorite, inexpensive wine that we like during the summer, and it’s a good accompaniment to these mushroom appetizers! 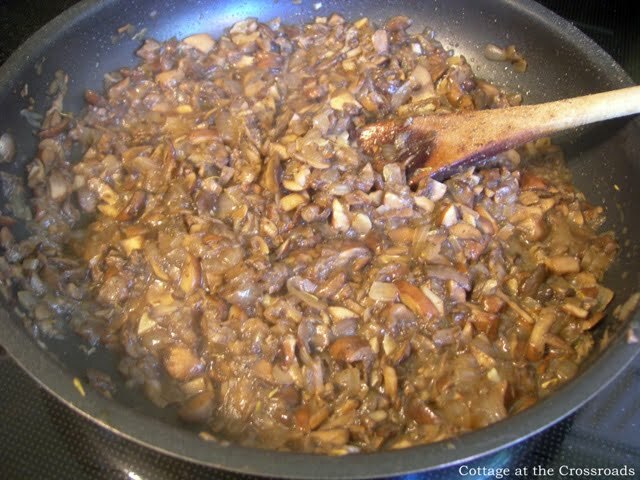 Add 2 tablespoons of heavy cream or some half ‘n half to the mushroom mixture and stir until all is mixed together. Set aside and let cool. 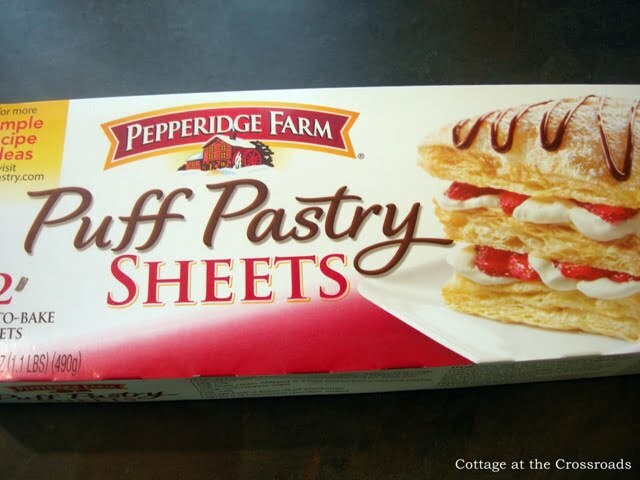 Spread some flour on a surface and unroll both sheets of puff pastry. 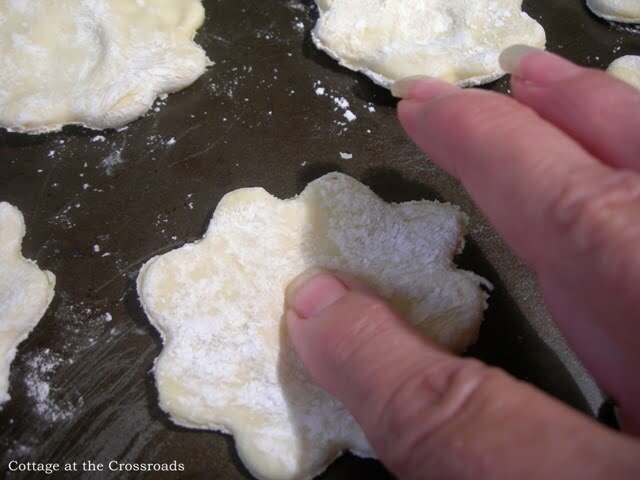 Use a cookie cutter to cut out some round shapes, or you can just cut some squares if you’d like. Transfer the cut outs to ungreased cookie sheets. I used my finger to make some little wells in the center of each shape, but you really don’t have to do this. 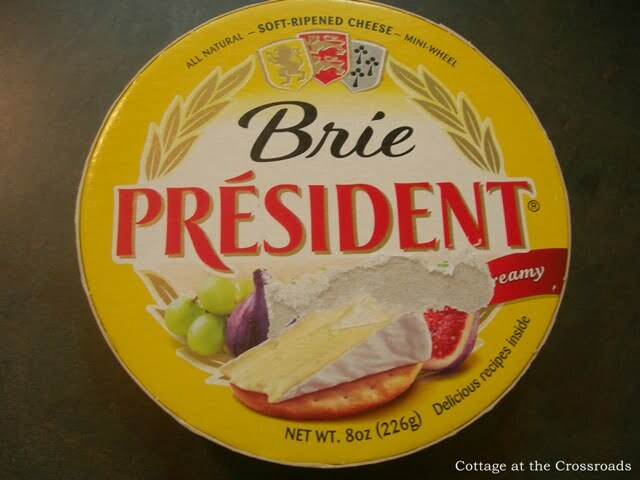 Next you will need a wheel of Brie cheese. 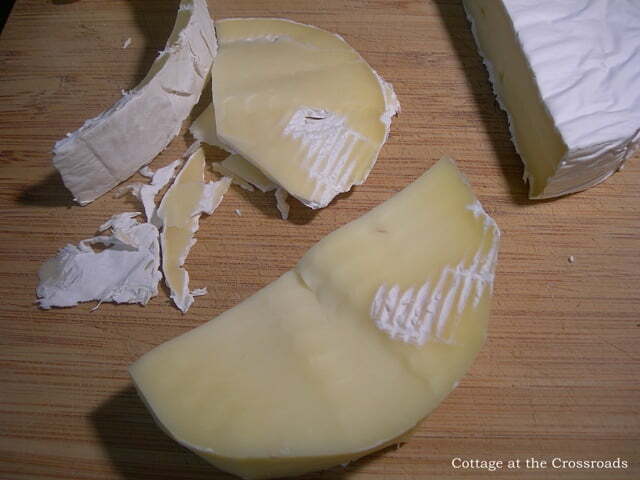 Unwrap the cheese and cut off the rind. Slice it into thin pieces about 1 inch in size. 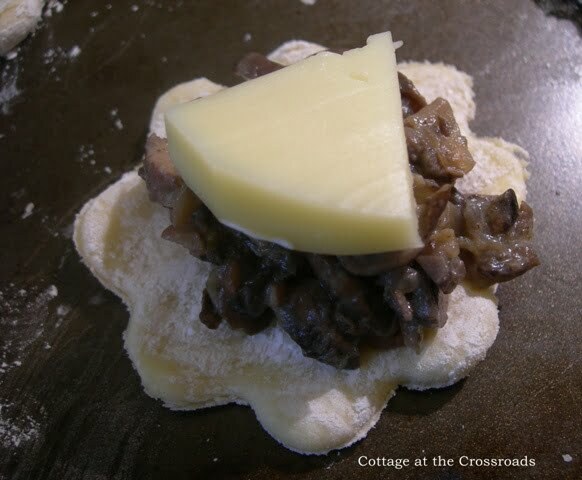 Place a spoonful of the mushroom mixture onto each cut out and lay a piece of Brie cheese on top of the mixture. Bake at 375 degrees for about 12-15 minutes or until the pastry is golden. Add a little fresh grated Parmesan cheese to each top while still warm. If you’d like a printable copy of this recipe, click HERE. 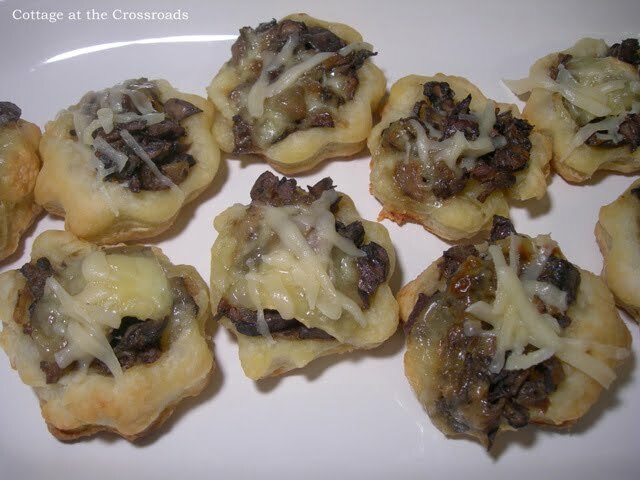 Hi, I’m new to your blog but this appetizer caught my eye as a perfect nibble for Thanksgiving. One hint…this Brie company makes a Brie log. Perfect for slicing and using with round crackers. 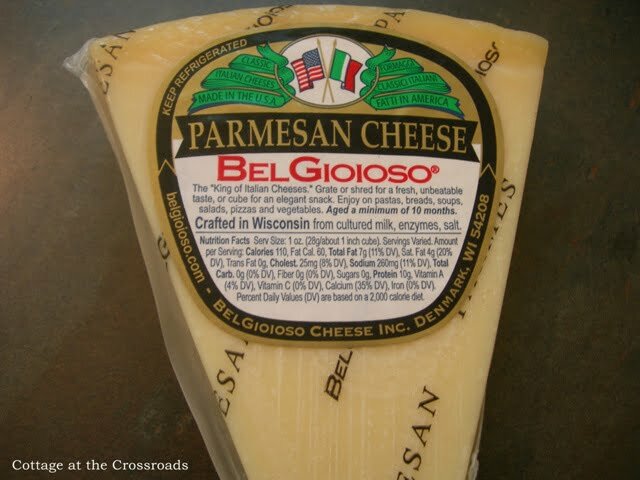 If you can get your grocer to carry it you will suddenly find yourself slicing up Brie for everything. Originally I found it at Walmart but my local grocer put in a special request. So delicious looking – I’m drooling. I will tell Mercedes that her recipe is now “famous” – she will be thrilled. Jane those look beyond yummy!! Oldest and I are the only ones in the house who eat cooked mushrooms. I will have to maybe make this for us one day. I am always looking for vegetarian appetizers..this one is fantastic!…Definitely trying this one…Thanks Jane!!! That looks so good. Maybe we will make it. Now that things are settling down to a routine in our temporary full time home:-), I have time to try to new recipes. This would be wonderful with our little appetizer suppers we do now and then. They look really yummy! I’m glad you shared the recipe with us, I’m always looking for new appetizers to try for parties. sounds and looks delicious! my family (even the kids!) love mushrooms so this would be a hit around here! thanks Jane! You have made me hungry!!! These sound so yummy, have to try them this weekend!!! Oh my.. Now that is YUMMY looking. I joined your blog after seeing you on another.. fell in luv with your home tour. Now I am enjoying all the recipes as well. Thanks for sharing. I am def using this recipe, the baked brie, the cucumber dressing… oh my. Getting hungry. Jane these look so delicious! I of course had to print this and can’t wait to get the ingredients to make them….thanks for this recipe!